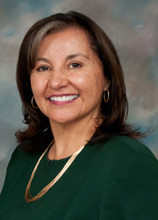 Professor Antoinette Sedillo Lopez will be a featured author at the Second New Mexico Women's Book Festival on Sept. 26 at Museum Hill in Santa Fe. She will be reading and discussing her book, Family Law in New Mexico, at 2:30 p.m. at the Spirit, Health and Family pavilion. The festival will feature six other pavilions: Special Topics, Fiction, Poetry, Creative Arts, History and Biography and Children, at which 71 New Mexico female authors will read and discuss their works in 30-minute intervals. This event, modeled on the Library of Congress’ National Book Festival, held annually in September on the mall in Washington, D.C., will celebrate the joy of reading and the creative power of New Mexico’s women writers. The event at Milner Plaza runs from 11 a.m.-5 p.m. and is free. Visitors also will receive free admission to the Museum of Indian Arts and Culture and the Museum of International Folk Art. Food booths will be open throughout the day on Milner Plaza.